Delete, modify or add Latitude and Longitude coordinates for the corners in area in the table below. "Insert!" to add the area to your model. Insertion point is row 0. Change the latitude and longitude waypoints in the table above to fit the area of your actual piece of land. Add or delete waypoints if required. Select an object in your model as the insertion point. Click "Insert!" to insert the object representing the land. Note that the insertion point of the selected object - and the first row in the table above, will be used as the insertion point. The land object can be moved afterwards if wanted. The global position of the Sketchup model can be set with the "Set this position to the models location!" link. The values for latitude and longitude - and the optional country and location text - will be added to the model. 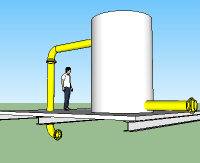 This information is available and can be edited in the "Sketchup > Window > Model Info > Geo-location" menu. The "Degrees, Minute and Seconds to Decimals Converter" is only a converting help tool. The values are not used directly in the model. The thickness option let you set the thickness of the inserted area. 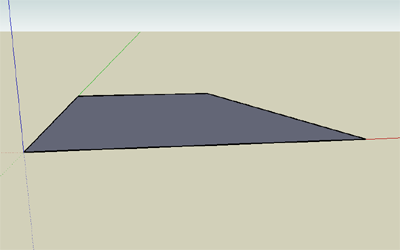 Thickness can be changed after insert with the Sketchup push pull tool.